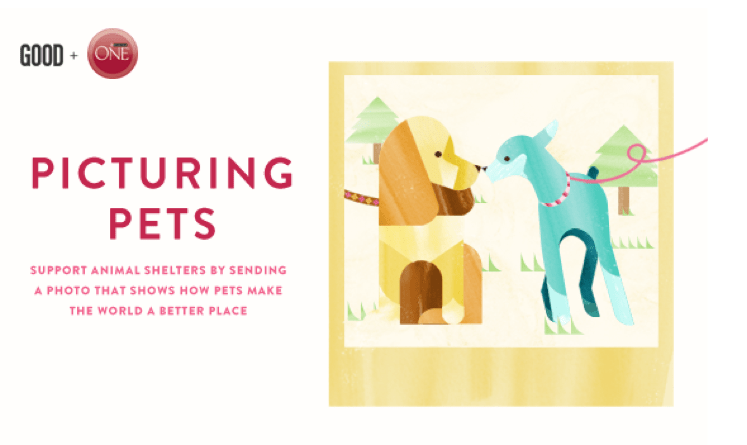 GOOD + Purina ONE Ask: How do Pets Make the World a Better Place? GOOD + Purina ONE® are using the power of photography to change perceptions around shelter pets and to celebrate how pets–of all shapes, sizes, and backgrounds–have inspired and changed lives across the globe, making the world a better place. The Picturing Pets challenge, launching Wednesday, July 31, 2013 at 12 p.m. PDT, calls all pet owners to celebrate pets by submitting a photo of your dog or cat along with a short description that shows how they make the world a better place. This is a step toward shifting negative perceptions about pets by picturing them in a new, positive light. A pet photoshoot and photography training session with award-winning photographer Nanette Martin at an animal shelter of her choosing. Through her nonprofit organization, Shelter Me Photography, Martin has dedicated herself to teaching photography techniques so that photos of shelter pets reveal their true beauty and personality, greatly increasing their chances of finding a home. Be a part of this positive movement: click here to enter your photo into the challenge! The Challenge ends Wednesday, August 14 at 12pm PT so get those photos up!